There is an interesting article in the Tralee Down The Years section of The Kerryman this week. 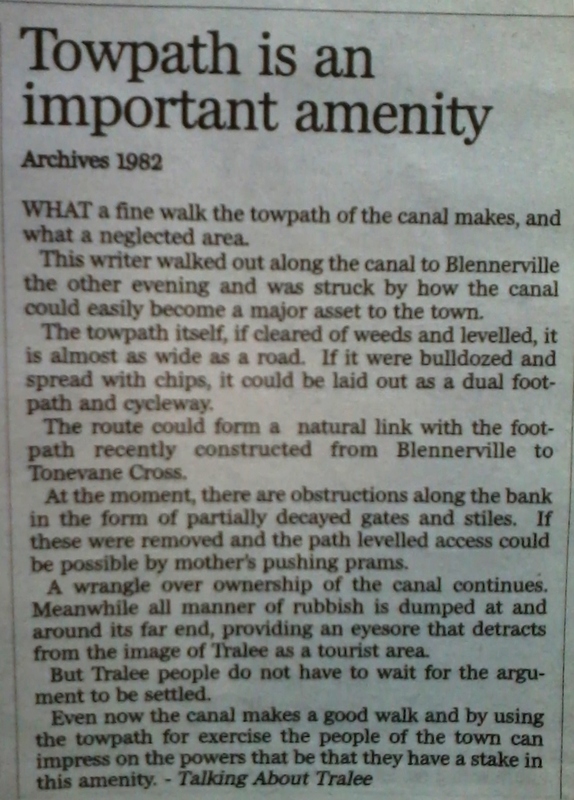 The article which was taken from the newspaper this week in 1982 highlights how the cannal path could be an important amenity. While much has changed over the last 30 years, it is interesting to note that many of the issues at the time are still with us today, but i think you would find it hard to find a anyone who thinks that the conversion of the unused transportation route of the ship canal was a bad idea. Hopefully in 30 years time our children will be looking back on similar clippings regarding the Tralee to Fenit Railway wondering what all the fuss was about.